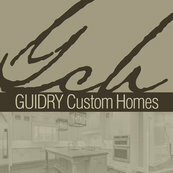 Guidry Custom Homes was the best choice we have made in a long time. Joe and Stephen assisted us from the earliest part of the project until our final move-in, and we couldn’t imagine doing it without them. At one of our lowest points, when we were even considering giving up on our dream home, Stephen stepped in and helped us create the perfect design for our family that also met our budget! Our home was completed on budget, on time, and our family has been enjoying it for 8 months now. We have been very pleased with this entire home building process, and would highly recommend GCH for anyone looking to build their custom home!